This article was released in my local paper last week (I had no idea until our PR agency told me this morning!). This emphasises the need for more HR professionals to get involved in Steps Ahead in 2016. I’m so proud of my mentees and what we’ve achieved together this year, I know that next year will be a successful year for them. I hope you enjoy reading this and I look forward to updating you all in the new year! Short and sweet update just to wish you all a very merry Christmas! Thank you for all your support, comments and suggestions over the past couple of months. I’m looking forward to posting more on my blog in 2016 and sharing some really exciting things with you! From my family to yours, merry Christmas and all the best wishes for the new year! Brace your diaries for 2016 networking! There have been so many exciting developments over the past few weeks that I would really love to share with you all. 2016 is shaping up to be an exceptionally busy year already so I am frantically trying to get organised (once I have moved house and unpacked those boxes this weekend!). You have probably heard the saying “it’s not what you know, it is who you know” and this couldn’t be more precise. Networking gives us opportunities to meet people from different industries and backgrounds, it can open doors, expand your knowledge and even present job opportunities just by getting yourself out there. Maintaining a work life balance when you are passionate about your profession is something that can be difficult to manage so I have to be incredibly disciplined on my time management. Therefore I am starting my spring clean early to get ahead of the game! I have recently started networking locally so in this post, I wanted to demonstrate how important networking can enhance your professional profile as well as giving you connections to people with priceless knowledge. Recently I was invited by Mike Willis to the Northants Business Club for an evening of networking and I can honestly say that I have never felt such a warm welcome! The club is made up of professionals from varying industries and backgrounds which provides the opportunity to learn, network and do business with other like-minded people. Some are business owners and others like me are from larger companies so it is a really good mix, I was very excited to finally meet Karen Teago from Gravitas HR (after years of speaking with her online!) and Simon Merriman from Solved HR so it was also nice to meet HR professionals who run their own businesses to see what their experiences are like when you go out on your own. I also met many other people including Philip Walding who lectures at Northampton University and likes to tie the taxman up in knots! They were all lovely and I look forward to doing business with them when I set up on my own in the future. If all that wasn’t enough, there are some very exciting things already in the diary for March, April and May so it looks like I am certainly going to be busy over the next few months. I will tell you more as soon as I am able to so watch this space! Get to know people, introduce yourself and more importantly be yourself. People are not always sold on a product or service, it is generally known that people enjoy doing business with people they know and trust so take your time when getting to know them. Regularly keep in touch to get the most from your relationships and you never know when your knowledge will come in handy for someone else! I hope this has helped some of you to get motivated and get networking, make 2016 your year! Thank you for reading and keep the comments coming! Sharing is caring so please share with your colleagues, friends or connections if you feel it could help them. Last but by no means least, if there is something you’d like to see featured on the blog, please leave me a comment below! Steps Ahead of the rest! I know it has been a while since I last wrote on my blog but now I am getting back into the swing of things! Moving home and juggling lots of exciting business ventures have kept me incredibly busy over the past few weeks. At this time of year, we often spend time thinking of the perfect gift or the right cards to send so in the new year, why not make a resolution to help others? In this blog post I wanted to emphasise the importance of helping the next generation into employment and how we as HR professionals can make a huge difference. 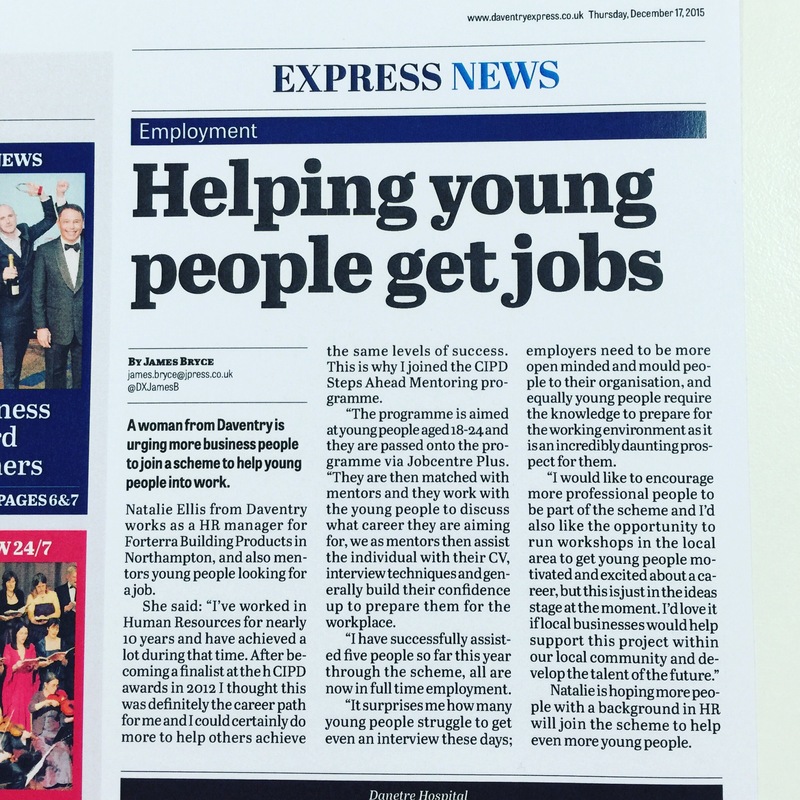 I’ve worked in partnership with the CIPD Steps Ahead programme (in conjunction with Jobcentre Plus) for the past couple of years and from experience I have found that it can really change a young person’s life by supporting them into employment. As HR professionals, we have a lot to offer the next generation by utilising our support and mentoring skills, whether it is helping structure the right CV, assisting with interview skills or even just helping boost their confidence. This could make a significant impact on the skills gap shortages that has been so highly publicized in the media of recent years. The scheme is aimed at job seekers who are between 18 – 24 years of age and has a success rate of 73% for those who have completed the programme. As a mentor I dedicate around one hour per week, per mentee (you can have up to three mentees at one time) and I tend to work remotely but as part of the scheme you can be paired up with local job seekers. It depends on your time and ability to commit to supporting them. The responses and feedback I’ve received from the people that I have successfully helped into employment has been staggering, they are generally really motivated and want to build a solid foundation for their career. On the other hand, it is also great experience for anyone in HR to get involved in as it can take you out of your comfort zone and provide a rewarding experience which will be another string to add to your bow. One of my successful mentees is Rick. He was a recent graduate, is incredibly clever but he lacked confidence to go for a role he really wanted. We worked together over a period of six weeks (as recommended by the programme). We started by identifying his chosen career path before building upon his existing CV to target those specific industries. Even this step seemed to boost his confidence significantly! I received a wonderful email from Rick this week, giving me vital insight into how the Steps Ahead programme has helped him into employment as well as the challenges he faced when starting to look for employment after university; I will be uploading Rick’s journey onto the blog to raise awareness of this fantastic programme so watch this space! A common problem that I have encountered when speaking with my mentees is a lack of specific guidance they receive whilst they are still in education. They explained that there were not adequate support mechanisms in place to support the transition into the world of work. They advised that a professional career advisor is someone they would like to see regularly before they are due to leave college, graduate from university or leave school as they would then be able to understand how to correctly structure a CV, prepare for the world of work and assist with interview techniques. I feel that this is a strong enough case for more professional people to get involved with programmes like Steps Ahead in order to support the talent of the future otherwise we run the risk of further skills shortages in years to come. My advice to young people would be; do not be afraid to go out there and seek the job you dream of, just as long as you have strong ambition, motivation, the drive to succeed and are prepared for some doors to close on you, you will make it. Many successful business leaders have had their ideas rejected countless times Richard Branson is a great example of this! 1. Be professional – dress appropriately and avoid slang language and be careful with email addresses! This is a pet hate for employers and gives off an incredibly negative impression, use your first name and surname to set up a professional looking email address. 3. Create a profile on Linked In (think of it like a business Facebook) – Did you know that over 70% of jobs are not advertised? By using Linked In you can network with other like-minded professionals plus you can automatically upload your CV to the site, a lot of recruitment agencies use the site as well as companies to recruit directly so it could significantly increase your chances of landing that dream role! 4. Do your research! Ensure you have researched the company, understand their values and more importantly what they do! The amount of people I have interviewed over the years and they’ve not known what the company does is astounding and not really a points winner so do make sure you know what you’re talking about before you go in! 6. If you are rejected from a role, make sure you obtain feedback so you can develop from the interview process, always remember that it may not be the right company at that point but it may certainly be in the future so by obtaining feedback you are ready for when that time comes! If you are interested in supporting this fantastic program whilst raising your own profile, please visit: http://www.cipd.co.uk/publicpolicy/steps-ahead-mentoring/default.aspx Alternatively if you would like to be mentored as part of the programme, please speak to your local Jobcentre Plus advisor who will put you in touch with a remote or local mentor. I hope you have enjoyed this blog, thank you for reading it and I’d welcome any suggestions that you’d like to see in future posts, just leave me a comment below.